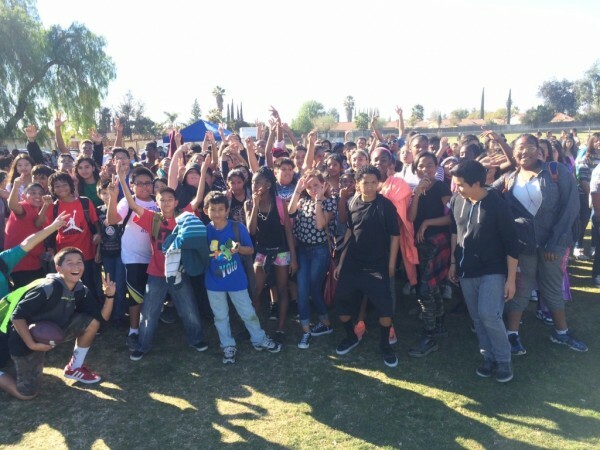 For the second consecutive year, California GEAR UP middle school Sunnymead hosted a GPA rewards BBQ for students who earned a 3.0 or higher. We had 612 students with 3.0 and above for first trimester attend the BBQ! This is the second year the event was held and the students were very excited and motivated. They enjoyed the food, music, and games played with friends and the DJ. This event highlighted college preparedness starts in middle school and our students are aware of the A-g requirements. They need to have the grades for high school graduation and acceptance to college. This is why we do such a big event to reward our students for 3.o and above to acknowledge they are on the right track. California GEAR UP middle schools host events to promote college going culture, understanding of the A-G requirements, and to provide additional resources and support for whole school communities, students and families. Sunnymead is in it’s 4th year as a California GEAR UP school and is located in Moreno Valley, CA. Check out their GEAR UP page on their website. Special thanks to Karon for this story!